A seriously genius way to get your cookie fix. Baked in a cast iron skillet, bursting with Nutella and cookie perfection! Welcome back, everyone! There is no time for small talk today. We have some cookie business to discuss. 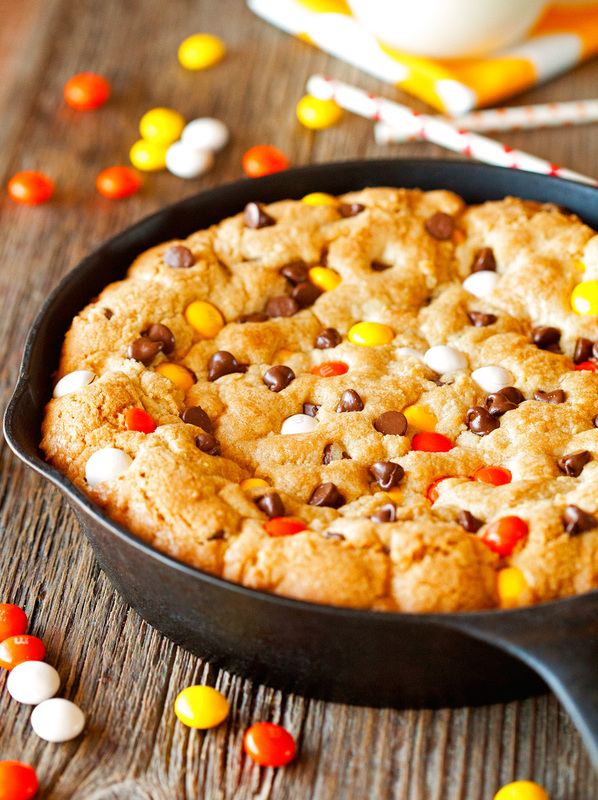 I am sure you’ve come across skillet cookies aka pizookies on the internets over the last couple of months. I’ve been seeing them everywhere and even though I’ve been the proud owner of a cast iron skillet since May of this year, I stayed away from creating any types of dessert with it because I had an inkling it’d be dangerous. But I have to admit that’s the first thing that popped into my head when I purchased mine at a flea market while we were on a family vacation. I actually couldn’t wait to put it to use once we got back. And boy oh boy, have I been loving it. While I’ve come to use it for pretty much every meal I prepare, I finally caved and made dessert last Saturday. While I am sure there were other options, I just knew I had to go with some kind of skillet cookie. I don’t think you need an explanation as to why. 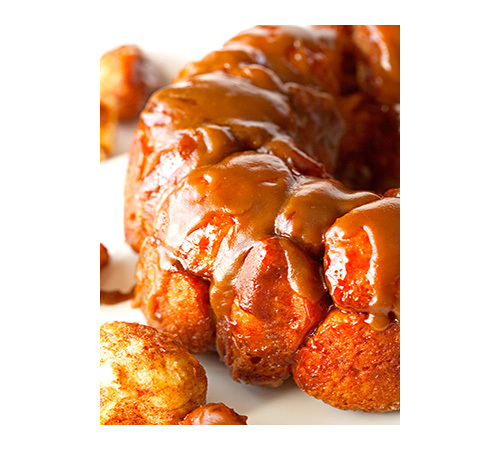 All I have to say is, go get your stretchy pants on and start making this unbelievable treat! Since I gave you plenty of double chocolate cookie recipes in the last couple of weeks, I knew I needed to make it up to you guys. In a grand way. And I think I might have just accomplished that. The excitement I felt while mixing the dough, placing it into the skillet, and watching it bake to golden wonderfulness is hard to put into words. It was as beautiful thing. Beautiful! 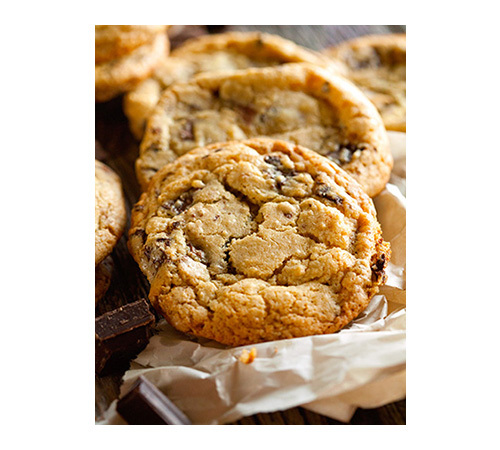 The recipe I used for this is my classic chocolate chip cookie recipe that’s been in my husband’s family for years and is seriously the BEST. Besides chocolate chips, I added some festive candy corn m&m’s and if you haven’t guessed already, stuffed it with scrumptious Nutella. Does it actually get any better than this? I think not. Just to put it into perspective, the cookie recipe usually yields 3 dozen regular-sized cookies. I really don’t think the pictures do it justice. 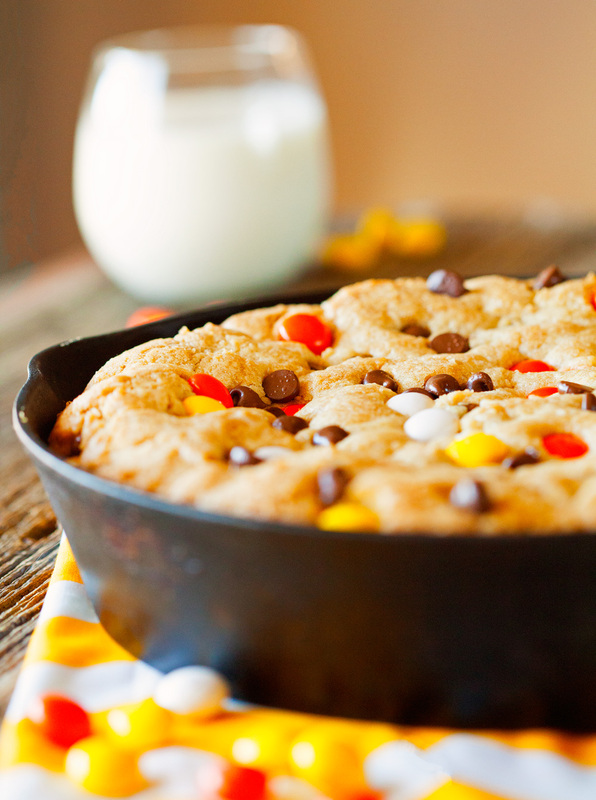 This pizookie (pizza cookie) is massive and makes for one incredible presentation. You’ll definitely will be able to feed a crowd. 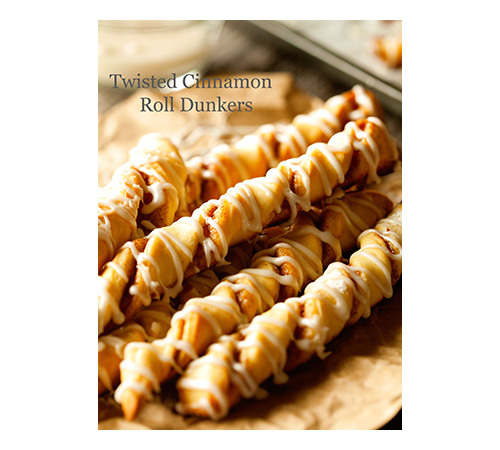 And the best thing is it takes even less time and effort to make this than it takes to whip up a batch of cookies. And a lot more fun, if you ask me. When I placed my skillet into the oven, I was a bid worried that this giant cookie might bake unevenly. But I have got to let you all know that it works like a charm. Every piece came out exactly like I hoped it would. Perfectly brown and crispy on the outside with just the right chewiness on the inside. A total success! I already can’t wait to come up with more sweet ideas that let me use my skillet. But for now, Deep Dish Nutella-Stuffed Pizookie definitely does the trick. Have a lovely start to your week! This dessert is a dream come true. 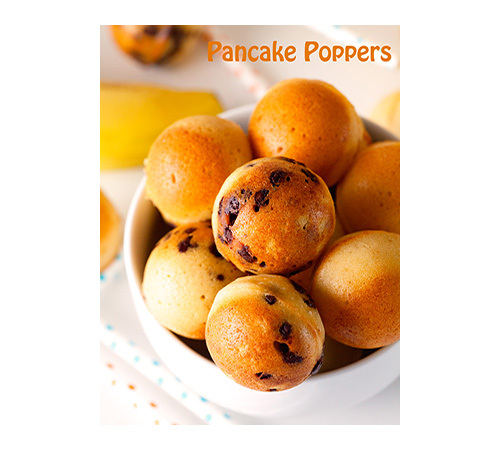 Perfect to serve for a big crowd and is sure to please everyone. YUM! Preheat your oven to 350 degrees F. Thoroughly spray your 9-inch cast iron skillet with nonstick spray. 1.In the bowl of your stand mixer, combine sugars, eggs, shortening, butter, and vanilla. Mix until creamy, about 2-3 minutes. Add salt and baking soda. Mix another minute or until incorporated. 2.With your mixer set to its slowest setting, add 1 1/4 cups flour. Mix until incorporated. Add another cup and wait until fully combined before adding the final cup flour. Once the final cup is added, mix until a smooth dough forms. 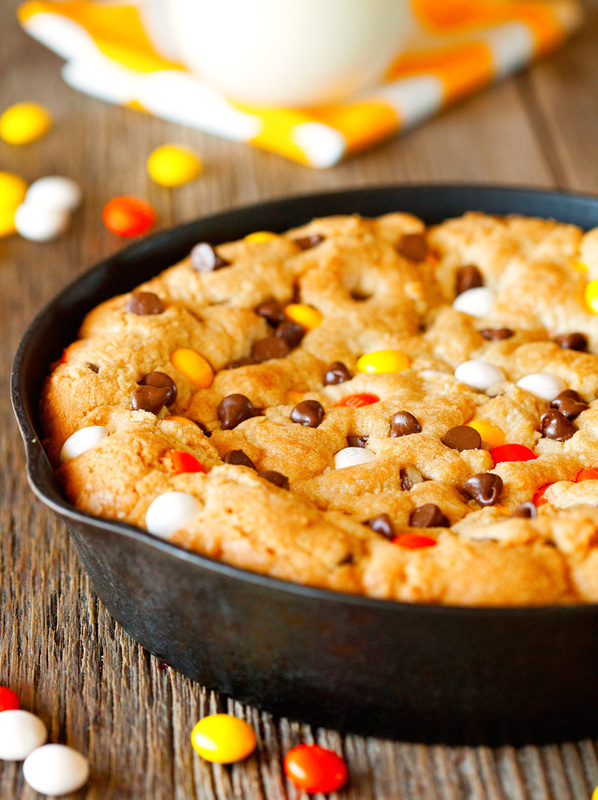 Remove from the mixer and using a rubber spatula, fold in chocolate chips and m&m's. 3. Press half of the dough into the prepared cast iron skillet. Spread Nutella evenly over the top, leaving 1 inch on the sides. Press the remaining dough on top and place in the oven. 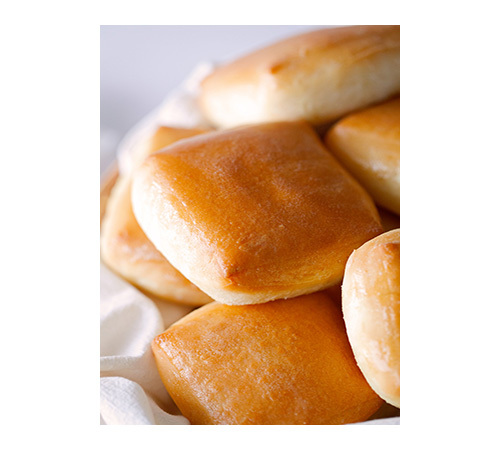 Bake for 25-30 minutes or until top is golden brown. Let rest for 15 minutes before cutting into slices (otherwise it will start to crumble). Serve and enjoy! Pizookie is best enjoyed if eaten on the same day, but can be stored in the fridge for 3 days. I just love how thick it is! Not to mention the Nutella peeking out there in the middle! Pinning to try soon! 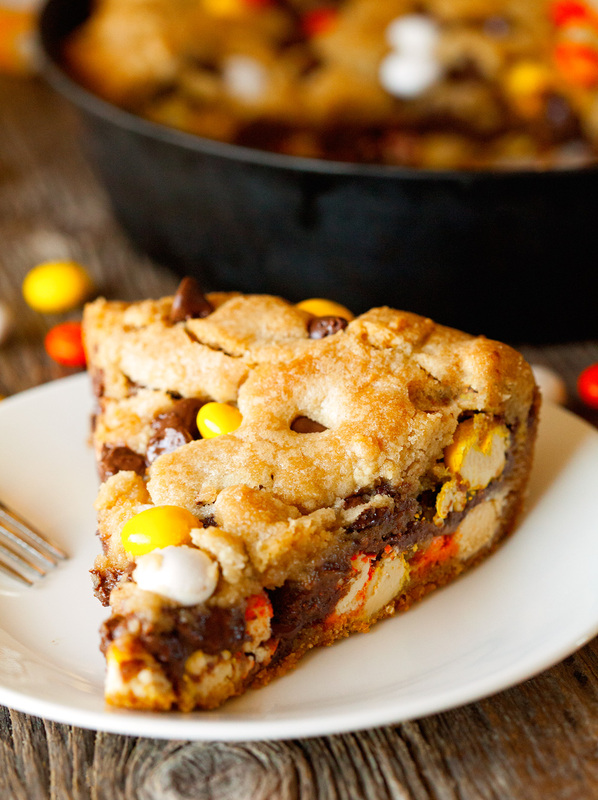 oh my god, deep dish cookies are officially the greatest thing EVER. that second photo is to die for, I almost fainted from excitement!!! beyond delish Kathi! Wow. If it has Nutella I will eat it. It looks amazing and I bet it tastes amazing too. I just got a few cast iron skillets and it’s ridiculous that I haven’t made a pizookie yet! Must get on it. 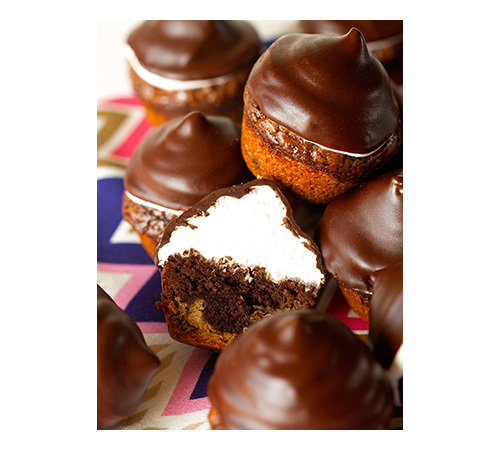 Love the nutella stuffing in this! I will be putting my stretchy pants on and making myself a skillet of this wonderfulness! It’s as if it is jumping out of my screen and calling my name, it looks so darn good! 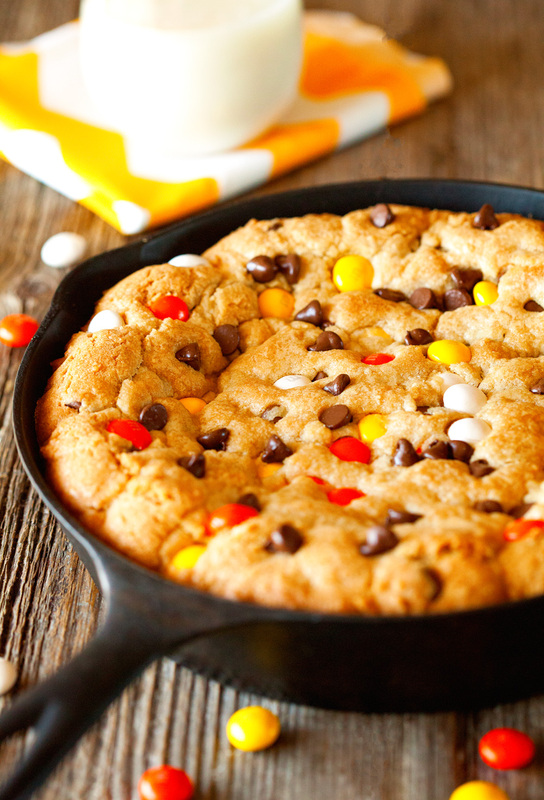 Great minds think alike, I just posted a delicious skillet cookie recipe! 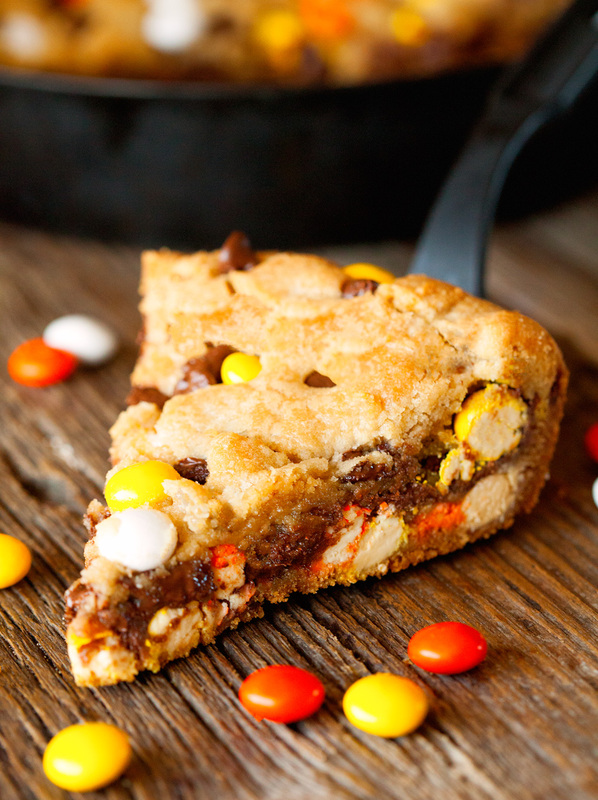 This looks amazingly good Kathi, love the Halloween sweets in each slice! Gah, this looks good. 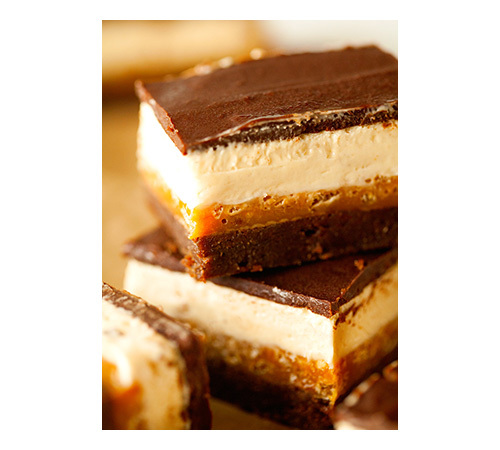 You have me craving dessert like mad right now! I have a cast iron skillet and am kicking myself for never using it to make a cookie!! 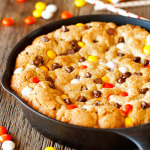 Skillet cookies are the best and this pizookie looks perfect! 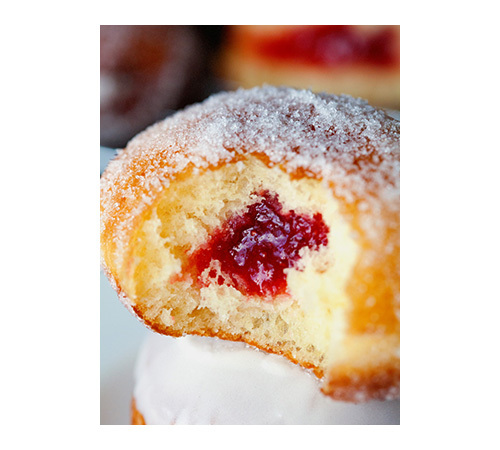 Love the Nutella stuffing inside – such a tasty idea! Oh my gosh! I don’t know what it is about a cast iron skillet, but it makes everything better. Love how thick the cookie is! I’d like a slice and a big glass of milk please!